Have you set any goals yet? This is the END of the decade, what will you do in the next one? Yesterday, we were talking about this next decade and how fast this last one went by, and I said "This next one is mine." Anybody with me? I've got a question for you, have you ever tried to do something impossible? Yeah, I've never tried either. Ever tried to do something highly improbable? SAY WHAT? I want to encourage you to do something this next year that you never thought in a million years you could have done! It could be anything! But whatever it is, don't be afraid to do it! Maybe it's finishing high school early! Maybe it's learning to play an instrument! Or starting a band! My Dad is planning on running a half-marathon this next year. Yeah, I know, wow! One thing that I want to do this next year is start my 'missionary training'. Yeah, that's right. I wanna be a missionary. What r u gunna do 'bout it? Another thing I want to do is learn Spanish, yeah, you like that one too? I guess that might be part of my missionary training though... Anyways, this is my dream for now, but what does it mean? I don't know really. It may mean going here. Or It may mean me thinking about going to a seminary. Or It may just mean studing at home! I don't know! But I do know that God's got big plans for me- He's got big plans for you and me! p.s. in fact, comment and tell me what you plan on doing this next year. and if you don't, I'll send viruses onto your computer, whahaha! p.p.p.s. i don't even know how to. I finally got some time after Christmas to upload some pictures, so enjoy! My favorite orphanage (if you're allowed to have a 'favorite'). Some of the seminary students from BEST (Berean Evangelical School of Theology) practicing the songs I taught them. Playing Canball with the students! Yeah! The kids at one of the orphanages playing "Do you love your neighbor" Burmese style! I know what I'm going to post on next, so stay tuned! Happy New Year... start those resolutions! p.s. I got some new music on Christmas, so I put it up on the side-bar to share! This is a blown up picture of it though, so look it up on your own to see it's real size. 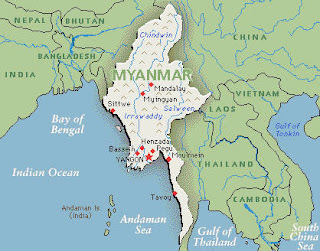 Down near the bottom of the country it's says in small type YANGON. And yep, that's where we went. There was three of us, Mr. Tom, Mr. Curtis, and Mr. Kade. like that? Anyways, we had a wonderful trip! The orphans that I visited were awesome! And not only did I encourage them, but they encouraged me a lot! I taught them around 10 songs (in English) 4 Bible lessons and 8 games! Yeah baby! the songs: I'm Forgiven, Famous One, All because of Jesus, I Lift my Eyes Up, Give Us Clean Hands, We bow Down, etc. the games: Capture the Flag, Hide-and-Seek, Duck Duck Goose, Do You Love your Neighbor, etc. the lessons: The Ten Lepers, Who's the Greatest? The Vine Growers, etc. I also had an opportunity to speek at a 3-day-semiar-type-thing and a few churches, and that was great too! Some of the greatest time I had over there was playing Canball (which is exactly like volleyball, except you can only use your feet and head... no hands...)with some seminary students. They were lots of fun! The first time I played with them, they let me use my hands 'cause I was like a gringo. But the second time... I was a native! Thanks so much for your prayers! Merry Christmas! haha, im now in the singapore airport on my way home! couldn't get to gmail, but it let me on the blog! my trip has been awesome!